This week is probably one of the best weeks of the year as it’s #POPSICLE week!! What? Is that a thing? Yes, it’s totes a thing. My boyfren, Billy aka Wit & Vinegar, said so and we best listen. 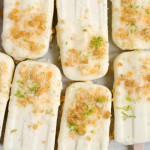 There are 26 of us frozen-treat-lovin’ bloggers posting our popsicle creations this week. Definitely click this link RIGHT HERE to see the full list of bloggers and pop recipes on Billy’s blog. 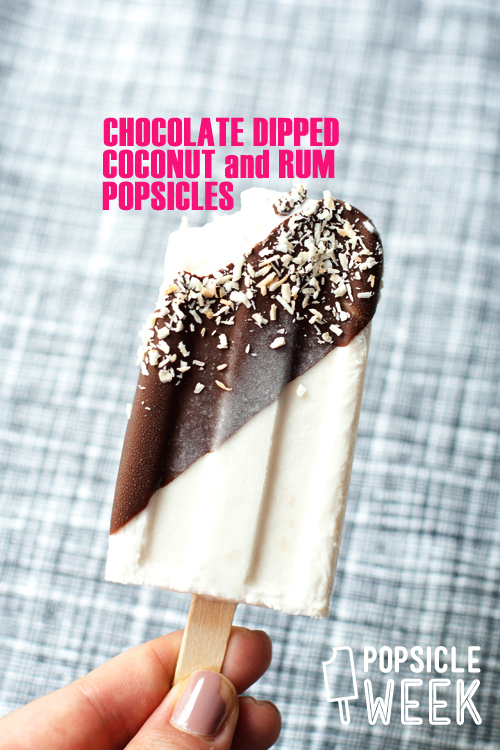 I made you some creamy coconut popsicles spiked with a little spiced rum and dipped in a crispy chocolate shell. The best thing about ice pops are that they are equally as easy as they are satisfying. The coconut is creamy with little toasty bits throughout and the rum brings that boozey warmth. The hardest part is dipping these in the chocolate shell…and really it’s not tough at all, just another step of deliciousness. The shell is easily made by mixing together melted chocolate and coconut oil – super simple, yet super magical. 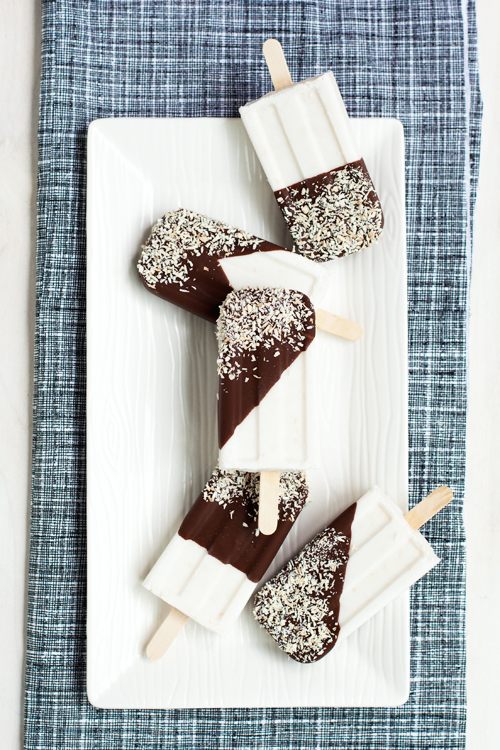 The coconut oil makes the magic happen…as soon as the chocolate hits the frozen coconut pops it hardens into crisp, chocolaty, magic. I sprinkled a little flurry of extra coconut on top for good measure…plus it’s so good lookin’! 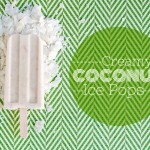 Creamy, coconut & rum popsicles dipped in a crisp chocolate shell. In a mixing bowl combine the coconut milk, toasted coconut, sugar, and rum. Whisk to combine and dissolve the sugar. Divide between ice pop molds and freeze 1 hour before inserting sticks. Continue to freeze until frozen solid – at least 4 hours. Melt the chocolate and coconut oil together, either in a double boiler or in 30 second bursts in the microwave, stirring between each burst until melted and smooth. 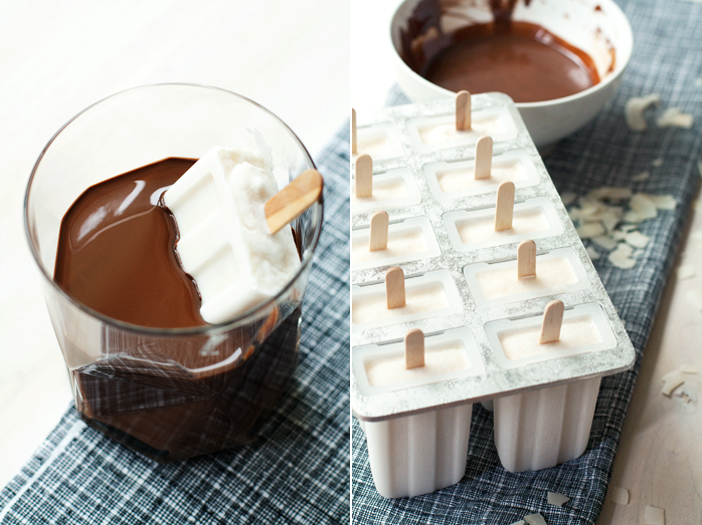 Pour the chocolate into a glass wide enough to fit a popsicle. Unmold the pops in batches, about 2 at a time, leaving the rest in the freezer, and dip pops into the chocolate. Sprinkle with more coconut immediately, the chocolate will firm up quickly! Enjoy! These pops aren’t super boozey—and as tempted as you may be to add more rum, don’t. More booze sounds like a grand idea, but it will inhibit the pops from reaching frozen glory…meaning, the pops will never freeze up right. 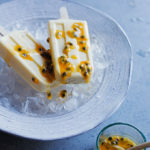 Do like Tracy does and dip these pops in some extra rum (or even bourbon!) to fulfill your cocktail-turned-dessert desires. « Roasted Corn, Tomato, Zucchini Quesadillas + a Shawlsmith London Giveaway! I love these photos so much! And I know I’d love these tasty pops too. Way to dip all perfectly, girlfren! I knew you would bring it.. These are the biznaz! Love your pictures. thanks for having faith, girl. Oh man!! These are awesome!! Coconut and chocolate??!?! Yes, oh yes!! These are amazing! 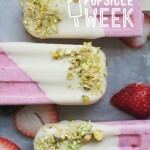 I am LOVING popsicle week, so fun! YES! So glad you approve, Tieghan! A-FREAKING-men! These look so luscious (is it creepy to describe a popsicle as “luscious”? Probs.)! You guys are making me want to get a popsicle mold right this very second. These look fabulous! I love all these flavors, especially together. These are coming up soon in my kitchen! Thanks for the inspiration! These are so goshdarn pretty. I want a dress that looks like them, is that weird? Not to be shallow, though–I know they taste amazing, too! I love you so much for making these. Want! My only regret from our Nashville vacay was NOT getting my paleta dipped in chocolate. I mean, what was I thinking? These are the prettiest!!! I think there’s a life lesson there…always go for the chocolate dip. WHAT A BABE OF A POPSICLE. Chocolate, coconut and rum is pretty much my ideal combination. Love these popsicles! Oh no you dihn’t! This is basically a cruise in the Caribbean, but for your mouth. Looks soo good! yes! it’s the less expensive alternative to real vacation. Friend! You’re making me want all the things! 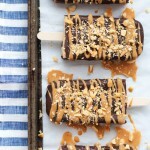 These might be the most gorgeous popsicles I ever did see. I NEED these in my life. Oh my!! I really should’ve added an umbrella! WHY are these not in my face RIGHT NOW!? Too much goodness. I’ll just chuck some across the ocean for you! I am literally salivating over that shot of the pop in melted chocolate. Chocolate and coconut and rum is my summer time goodness trifecta. Chocolate because YES. Coconut because tropical, and rum because it makes me wanna dance. So, these are KILLER. And that photo with the frost creeping up the chocolate? Amaaze. Ok yum. Making these ASAP, then eating them all. These pops are like my spirit animal. SO GOOD. These look sooo yammi! I am definitely going to give them a try! I need to buy these molds, and start making pops!!! I can’t wait to make these. I buy store brand coconut pops all summer long. I grew up in Chicago were home made paletas in all sorts of flavors were sold by cart vendors wandering the neighborhood. I miss them dearly. Yours looks great and I’m definitely going to give them a try. Thanks for sharing the recipe. I assume it is sweetened coconut milk. I know summer is technically over, but I’m thinking this is going to be my sweet treat of the week. They sound lovely. It was just regular, coconut milk from the can. I don’t believe it’s sweetened. Thanks! I have a Progressive brand mold that I purchased from Amazon. I had trouble with the chocolate coagulating quickly and not sticking to the pops. Was it just not hot enough so I need to remicrowave after 1 or 2 pops? you may need to remelt the chocolate. It should be fairly thin and very melted. I just saw these on Pinterest and had to come get the recipe. 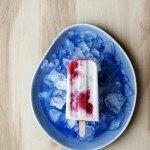 Your popsicles look amazing! I can’t wait to try making them!